Welcome to the final article in my jazz guitar basics series! Although we’ve only scratched the surface of jazz, we’ve covered lots of the fundamental topics that a beginning jazz guitarist must know. We’ve discussed the main jazz guitar chords that you need to know, as well as the theory behind those chords. We’ve also discussed many of the artists and tunes you need to know. If you’ve stuck with me for those first 4 articles, and are still here, congratulations! As I’ve said, jazz is not a style of music that is always easy to understand and learn. (That’s why I love it!) Not only do I hope you’ve read those articles but have also applied your new knowledge by doing the challenges I’ve left for you at the end of each one. Now I want to discuss the mother of all topics for jazz… Improvisation. It’s a skill that I have found the most challenging in my musical journey. As I’ve said before, jazz tunes can be a bit tricky and confusing, and here’s why. As you may have noticed from my article on common jazz chord progressions and tunes, sometimes non-diatonic chords are used. The minor 2-5-1 progression is a good example of this, but there are many others. Not to mention the fact that tunes will often modulate (change keys) right in the middle of the tune. On faster “up” tempo tunes this can get pretty challenging. But, if you are like me, you appreciate a good challenge, and if you love jazz music enough, like I do, you’re more than willing to take on the task of learning how to become a proficient jazz guitarist. Not only, do you accept this challenge…you look forward to it! As well you should. Let’s start with a basis of what improvisation actually is. For the sake of this article, here is my definition. I’m going to refer to it as “composing and playing melodies over chord progressions in a tune.” Simple enough, right? I’d also add that it embellishes the head melody of the song brings out the “personality” that the tune intends to give off. Jazz is a language. Just like a spoken language has many accents, you can tell when a melody has a “jazzy” accent to it. It’s your job to learn this “accent” and be able to “speak” it with your instrument. This language will be known as your jazz vocabulary. Just like you may have a few go-to licks for rock or blues improvisation, you need to learn the same thing with the jazz language. And much like learning to speak another language is not easy, acquiring your jazz vocabulary won’t be easy. With that being said I think it’s best if you have a well rounded approach to learning how to improvise. Let’s discuss that. In my experience, I think a multi-faceted approach of learning your jazz vocabulary is best. It’s not one single approach, but an assortment of many approaches that has helped me acquire what language I do have. Below I explain many of these concepts. Let’s go over the multiple ways you should approach learning to become a jazz improviser. Much like learning a foreign language, you should immerse yourself in the language of jazz. I’m talking about ACTIVE LISTENING. Not simply for enjoyment. As nice as it is to have jazz playing in the background, while you’re busy with other tasks, this is not the type of listening that will help you. It needs to be listening with intent, and possibly with a notebook handy. Take notes. Jot down timestamps in songs to go back and study later. From this you will learn the way that other improvisers sound, and the mood they create in their melodies. You can then move to the next step of actually making your favorite artist’s language, the language of your own! Transcribing has probably been one of the most helpful methods for me in developing my vocabulary. When I say transcribing, I’m not talking about it in the traditional sense of writing down the melodies note by note on paper. I certainly don’t discourage that. It’s just not what I’m talking about here. I’m simply talking about borrowing (ok, stealing) musical ideas from other artists and incorporating them into your playing. Whether they be licks, entire solos, or just notes a solo starts or ends on, this has always been a great way for many musicians to pass down language from one generation to the next. Pay attention to what scales they are using. Pay attention to what arpeggios they are using. What scale/arpeggio are they playing over specific chords? What trends do you notice with a particular artist? Are they trends you can use if you like them? Are they ignoring the rules and doing their own thing? When you transcribe another artist, you can really get a sense of what is in the artist’s mind when they are playing. Experienced musicians and improvisers are often asked “what are you thinking when you’re playing?” Transcribing is probably the best way to get the answer to that question. Make transcribing and studying your favorite artists a normal part of your practice routine. Chord tone soloing is a pretty simple idea. It means that, as the chords change in a tune, you play the notes of that chord. If you have no inspiration from other artists, or you don’t know what to play over certain chords, this is a good start. When chord tones are played individually, it’s called an arpeggio. So, when a song is playing, say, an Am7 chord, you’d be playing an Am7 arpeggio, perhaps in 8th notes, quarter notes, or whatever you feel like playing. Then when the song switches to a G7 chord, you’d play a G7 arpeggio. Make sense? By the way, Mimi Fox has a great looking course on Truefire, with an excellent freebie video where she explains exactly this concept. Click here to check it out. (affiliate link). I’ll certainly be getting this course soon! However, if you arpeggiated your way through an entire chorus as your solo in 8th notes, it wouldn’t have much personality of flare to it. But, the idea behind this approach is that you can use it as a foundation to form licks, and develop your solos. When analyzing a tune, it’s a good idea to sit down with the lead sheet and a pencil, then over each chord, determine what your options are. For instance, many substitutions can be used over various chords. Key center soloing is the idea of determining what key a song is in, then using the scale of that key to improvise over the chord progression. This is commonly the way I improvise over rock, pop, or even blues tunes. You figure out the key, then use your ear to slide up or down the fretboard to determine the key and there you go! You improvise! This approach can work with jazz tunes…until the key changes, or non-diatonic chords are played. Then you need to alter or determine a different strategy. The key center soloing approach is not entirely distinct from the chord tone approach. The only difference is you are thinking more in terms of scales instead of arpeggios. On fast moving tunes, this may be better. For instance, in the tune “Blue Bossa” it starts out in C Minor, and stays there in the first 8 measures. I can use any form of C Minor Scale pattern I want for that part. But in measures 9-12, it modulates over to Db Major. So we obviously can’t stick with our C Minor Scale pattern can we? We need to switch over to a pattern in Db Major. You may be thinking that the key center approach doesn’t have to be different form the chord tone approach. To that I would say you are absolutely correct! The cool thing is, is that in any given CAGED scale pattern on the guitar, all 7 arpeggios and modes of the Major Scale are contained within that pattern. For instance, take a look at the “G” pattern below for the key of C Minor. This alone, is a pattern we can use for measures 1-8 because it’s all in the key of C Minor. But let’s take it a step further. and use the chord tone approach. Here are the first 4 measures of Blue Bossa. As you can see, those notes are all in the scale pattern of the C Minor that was shown above. This is how you can combine the ideas of the key center, and chord tone approaches together. Regardless of what “approach” you use, with enough practice, you’ll eventually start landing on the notes that you want to anyway. “Chromatic notes,” (as they are often referred to) are those that are non-diatonic to the key of a song. In other words, outside of the scale. Once you study some jazz musicians, you’ll start noticing that many of them use this idea of “chromaticism” to add variety, or quite honestly, make shortcuts for themselves, to get from one musical phrase to another. But who is to say that these notes are “incorrect?” Nobody really! As long as it sounds good to them, and the listener, that’s all that really matters. The bottom line, no matter what approach you take to learning how to improvise, it’s all about taking what you have in your head (and in your heart), then using your fingers to create the sound you want to create. If something sounds good, then it will make sense theoretically, some way or another. If you hit a wrong note, then you can learn that X note doesn’t sound good in X situation, over X chord. It’s all about your ear. Use it! Everyone has their influences, but you can’t just repeat transcribed solos for every song unless you want to have no originality in your music. I’m not saying to ignore all your influences, because I certainly encourage you to take other licks and add your own personal style to it. But why not try writing completely new material? Basically, the more time you have on the instrument, the better you’re going to be. That is, of course, assuming that your practice time is spent wisely by practicing the concepts I’ve laid out for you above. 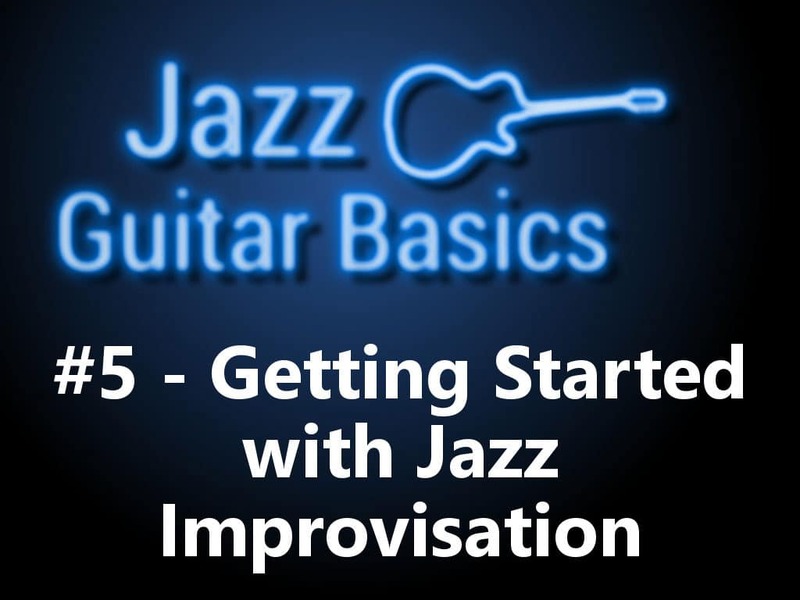 Like my other articles on jazz, this only scratches the surface of jazz guitar improvisation, but I hope if you are enough of a jazz fan, you’ll keep chasing your goals of becoming a jazz musician. In closing, I’d like to say thank you for sticking with me on this jazz guitar basics series. I hope this article has helped you, and I hope the entire series has helped you gain a better understanding of the often confusing world of jazz!